Ullapool harbour has long been a focal point of the village for tourists, situated, as it is in the centre of Shore Street and also now the ferry terminal for Stornoway. 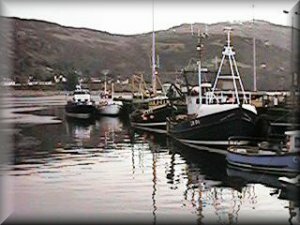 For over 200 years fishing has played an important role in the economy of the village, which is hardly surprising when one considers that Ullapool was founded as a fishing station in 1788 by the British Fisheries Society! In those days the main species, herring, were netted by local fishermen from small sailing ‘dipping luggers’ and ‘Zulu’ class fishing boats and during the season Ullapool was transformed into a hive of industry as boats and herring gutters arrived from all parts of Scotland and Ireland to take part in the frantic processing of the ’silver darlings’. It is said that much of Ullapool is built on shingle and soil brought over as ballast in the Irish boats, which then filled up with barrels of salt, dried or smoked herring. Over the years, when the herring failed to materialise in the waters around Loch Broom, the local fishing fleet went into decline and the villagers had to look elsewhere for their livelihoods. However, the industry received a boost during the Second World War when fishing on the east coast became too hazardous because of the mining of those coastal waters. After the war, catching techniques were vastly improved due to modern technology and the ever-increasing size of the fishing boats, once again Ullapool thrived as thousands of tons of herring were off-loaded on to waiting lorries for processing – mainly at the east coast ports. Ullapool pier had to be almost doubled in size to cope with the increased activity. However, it was not long before the stocks became so depleted that a total ban was placed on the herring fishery. It is interesting to note here, that during all the changes which took place within the fishing industry that not one local boatman aspired to progress towards the purchase of one of the purse-net seiners with their awesome catching power, which still visit Ullapool regularly in pursuit of mackerel and herring. In the late 1960’s to early 1970’s low-draft Scandinavian cargo “Klondykers” appeared in Ullapool to buy the herring. They employed many local men to ice the herring caught by the east coast boats which was then taken to Norway, Africa and the Canaries, etc. These boats would then return laden with fruit for the home markets. As the herring again declined around 1975 and the nutritional value of mackerel became apparent, we experienced the amazing sight of up to 70 Eastern Bloc factory ships anchored in Loch Broom and Annat Bay – long before the end of the “Cold War” – and often viewed with disbelief by visitors! On occasions their numbers swelled by Nigerian, Irish, French and even Japanese klondykers, all intent on cashing in on the mackerel bonanza – so once again Ullapool harbour had to be extended to cope with the extra traffic. The klondykers literally were processing factories and the end products were loaded on to reefers to be exported to all parts of the world. They often stayed for 6 months out of each year and their crews could increase the population of Ullapool to over 400! They came ashore in watches, in small orange ‘liberty’ boats to buy up all the goods, which were unavailable in their own countries. Shop owners smiled happily as their stores were quickly emptied of all manner of electrical goods, coffee, cosmetics, ladies tights, etc. and there were even buses laid on to take the crews on shopping trips to Inverness! In the early days of these visits by the Eastern Bloc ships, the crews had little or no sterling with which to buy our goods, but not to be outdone, they would often be seen on the pavements selling shirts, towels, fur hats and beautifully made model sailing ships. Needless to say, many hotels and homes in Ullapool now boast one of their carefully detailed models. Today the klondykers are virtually never seen in Loch Broom due to the economic crisis in Russia and the subsequent disastrous drop in the prices of mackerel; much to the concern of our larger East Coast pelagic fleet which now lands relatively small quantities of mackerel for the home market. Many people still miss the sight of the klondykers lights reflecting on the still waters at night, especially at Hogmanay when they would welcome in the New Year with rockets and haunting blasts on their sirens. Today the local fishing fleet consists of approximately a dozen boats from around 10 meters to 18 meters in overall length. 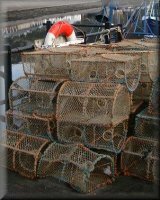 Their catches consist of mainly nephrops (Norway Lobsters), otherwise known as prawns, although some of them also land lobsters, scallops and latterly green/velvet crabs. One or two Ullapool fishermen handpick their scallops using sub-aqua gear from small fishing boats. The smaller boats mostly use static creels for nephrops, in fleets of up to 80, all attached to ground ropes and buoys and baited with pieces of herring or other species. They fish all year round, weather permitting, in areas of Loch Broom, the Summer Isles and the eastern fringes of the Minch, lifting their creels with the assistance of hydraulic pot haulers. They return to port each evening to land their catches live, which may be available in the local hotels and shops during the tourist season. The bulk of the catches go by refrigerated lorries to various processors in the area and much of it ends up in Europe where it is marketed as langoustines. The lager, local boats trawl for the nephrops that live in “burrows” in the areas of sandy mud on the seabed. In the summer, when darkness is almost non-existent, the boats are able to fish much further a field and may often land their catches at Gairloch, Lochinver or even Stornoway, as well as Ullapool. Occasionally you may also spot a Guernsey crabber/lobster boat or French trawlers unloading their catches at Ullapool pier when they come in to land their catches on refrigerated lorries en route to mainland Europe. Ullapool is indeed a very cosmopolitan port! Use the menu below for a walk through the past history of Ullapool. If there is anything you would like to add or if indeed you have some old photos of Ullapool and its people we would love to hear from you.